If you need a letter of invitation to attend SUSY14, please contact us. Most major airlines fly to and from Manchester Airport, which is located about 10 miles south of the city centre; for more information about flights please visit the Manchester airport website. 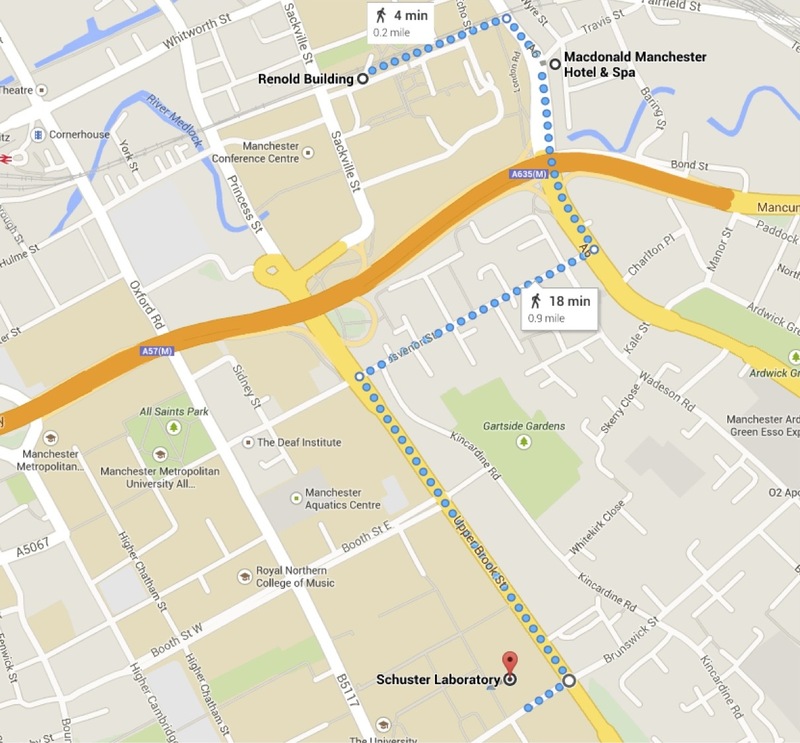 The airport is linked directly to the city centre by fast, frequent, 24-hour train links to both Piccadilly and Oxford Road rail stations, which are both about a ten-minute walk from the Renold building, where SUSY2014 is being held, and from the recommended accommodations. A taxi from the airport to the University will cost approximately £25 and take 20-30 minutes. 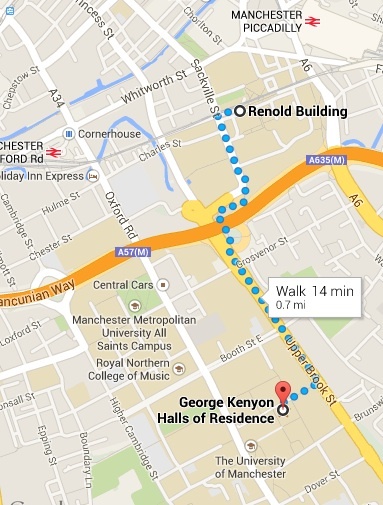 There is also a local bus service (number 43) between the Manchester Airport bus station and the University. Bus tickets can be purchased with cash from the driver. For more information see the Traveline NorthWest web pages. You can also fly to Liverpool Airport, which is mainly served by easyJet, KLM and RyanAir; see their destination map. A taxi from Liverpool to Manchester will typically cost about £75 and take a bit more than an hour. There are also buses from Liverpool Airport to the Manchester city centre (more information can be found here), which cost about £12 for the round trip. 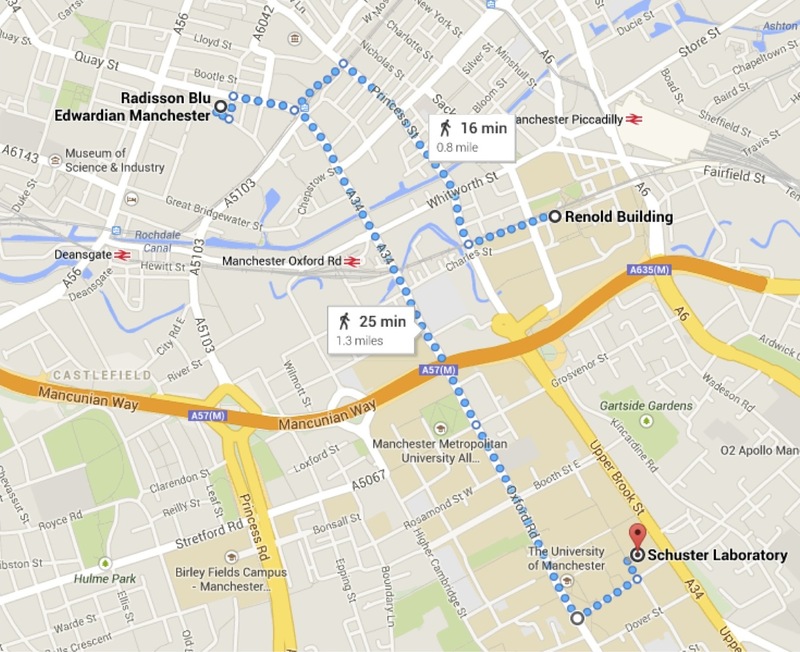 The rail stations nearest to the University are Manchester Piccadilly and Manchester Oxford Road; each is about a ten-minute walk to the SUSY2014 locations. For train times and ticket booking, consult National Rail. Please note that train ticket prices in the UK vary widely with travel times and how far in advance you book the ticket. Buying your ticket on the train is possible, but the same ticket can usually be purchased for much less if you book in advance. Manchester is about 200 miles north of London. You shouldn't need a car during the workshop; transport will be provided for any venue that is not within walking distance. However if you are driving to the conference and are a sat-nav user, the University's postcode is M1 3BB. National Express coaches serve over 1,200 destinations across the UK from Manchester's Chorlton Street Coach Station, which is near Piccadilly railway station. Please consult the National Express website for coach times and tickets. 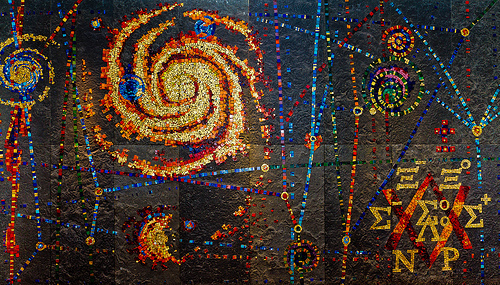 Further information, together with maps of the campus and surrounding area, can be found on the University's visitors' pages.